Meet Magnesium® RS, the newest addition to the Oreck Magnesium model line! Like the original Magnesium, it's got incredible suction power but more features. 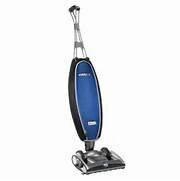 At less than 8 pounds*, Magnesium RS is one of the lightest, full-powered, swivel-steering upright vacuum cleaner in America. With its new SlimSwivel™ Design and furniture-friendly, low-profile physique it's an effortless way to maneuver around any obstacle and clean every floor in your home—upstairs and downstairs. The wireless two-speed QuickSwitch® in the handle enables you to select the right power levels and move smoothly across all floor types. The large, high-performance wheels give Magnesium RS the agility it needs for every surface, from hardwood and tile to plush and frieze carpet without stopping for manual adjustments. It's so lightweight that carrying it upstairs is a cinch and so powerful it feels self-propelled.